This closet is located in a palace in rural Texas called Champ d'Or. 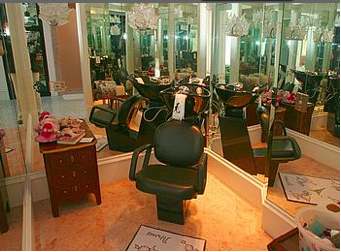 It is inspired by the original Chanel Rue Cambon showroom, and is in many ways a replica of it. Note the fabulous chandelier, black lacquered cabinets, and glassed in cases for handbags (of the non-Target variety). 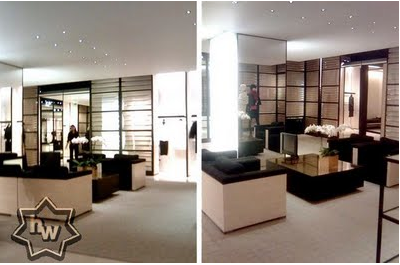 Here's a look at the current Chanel showroom, modernized - but still black and white. Courtesy fabulous international shopping blog Haute World. 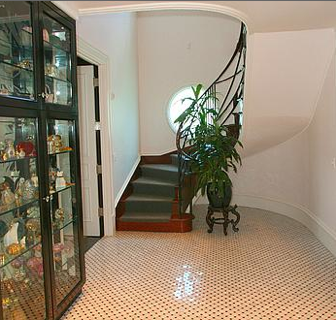 More views of the glassed in shelving at Champ d'Or, and the staircase leading to the second floor of the closet. What? You thought closets were just one floor? 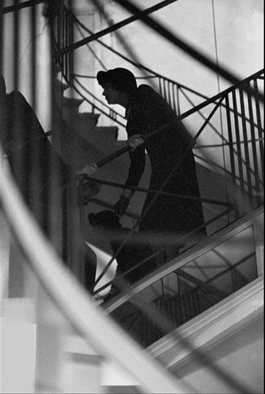 The stair is inspired by the famous Chanel mirrored staircase (sans mirrors, oddly). The original mirrored stair: note the similar railings. Here, Chanel is watching her show, hidden from the eyes of guests below. Nearby (relatively), at Champ d'Or, the Shampoo Room, not to be confused with the bathroom. The grand exterior of Champ d'Or. 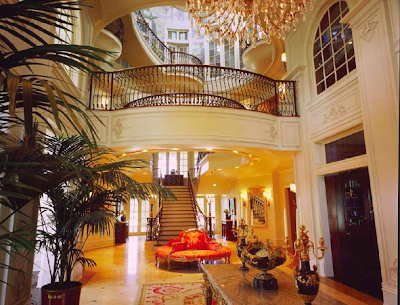 The entrance hall. Like a very, very beautiful... hotel. Very Monte Carlo, actually. Care to buy? Frankly, despite the Chanel closet, the style of the house to me is more "we have a lot of money" than "we have a lot of taste." Champ d'Or is currently on the market for $27,500,000. Which is a steal actually, compared to its original $72,000,000 price tag (it has been been for sale since 2003). That's less, according to one realtor, than an actual French chateau would cost. The owners (who built it) only lived in the house a short while before deciding, according to one news story, that it was "too much house for them." Really? Gee. That must have been a shock. 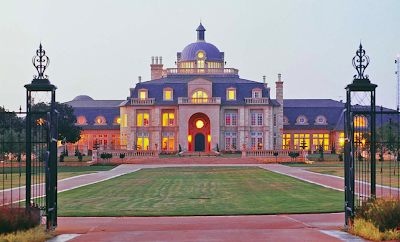 I can't imagine designing and building a 48,000 square foot home, complete with a 78 foot central dome, ballroom, 3 kitchens, 2-story theater, a "gift-wrap room," conservatory, wine cellar, indoor racquetball court, and a cedar-lined 15 car garage, and then moving in and realizing it's TOO BIG. I have an idea: one thing many American people do is combine room functions, which lessens the amount of space they have to build. For instance, you can make your food in one part of the house and CARRY it into another part of the house, which saves building multiple kitchens. Even more amazing (I know - I'm just a great one for ground-breaking ideas), you can wrap your gifts in a room intended for ANOTHER purpose. A living room, bedroom, or even the special room you designed for tying your shoes, or the other special room you built just for making wreaths. Actually, you can wrap gifts anywhere, come to think of it. Even outside. On your tennis court. For a video of the interior, click here. I'd rather live in a broom closet in France than this in rural Texas. Only in Texas .. . as they say! I remember reading about this house when it first hit the market - not really surprised it's still sitting all alone on some vast stretch of prairie. I, too, love closets and pantries. Truth be told ... . I even love my garage! Ah, this reminds me of a similar place in the Atlanta burbs that used to be on the market. As you said, lots of money certainly doesn't equal taste. It's fun to gawk at other people's extravagances, though, isn't it? Have a great week! That closet is stunning. 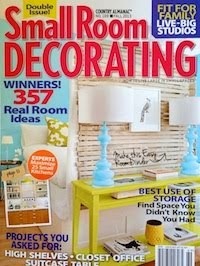 Between this post and Sarah's post, I'm now dying for a closet makeover! And you're so right. I can't imagine how anyone needs 48000 sf. (or even 4800 sf. absent a ton of kids). Muliple uses for rooms? Bite your tongue!